Agga-bai such a low opinion of moi. Now it is your turn for ootha-basha. Last week a friend, visiting from Pune, gifted me kokum instead of bakarwadi. I added it to my usual phodnicha waran. Before long those strange, by now turgid shapes were floating on top. The kids flat out refused to consume that thing. More for us!! Ohh well..I thought kokum would look too obvious :(. Next time, take out the kokum before bringing it to the table or showing the varan to the kids. They will love the varan. 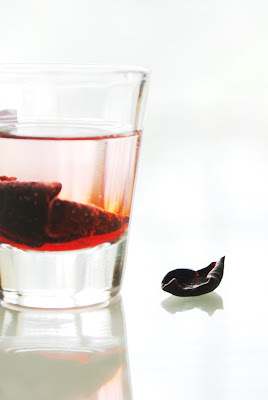 Medha did various things: sucked on the dried kokum, ate the soaked kokum and even drank the deep pink water! Shilpa, so you knew it all along then! That eye and the two eyes that the one under it had me wondering if this was really kokum! And yes, he cooked tilapia in green curry sauce with beans - a very easy recipe. I am going to polish it off as a late lunch now. That was the highlight of my Mother's Day! Do you have an email address where we can contact you directly? I would have never guessed! From that angle, it didn't look like kokum at all! great picture! i thought 'kokum' and the Kerala 'kudampuli' are the same. but they seem to be different fruits used in fish curries! You should try the kokum kadi they serve with Goan thali meals. Just great, a combination of tangy, salty and spicy. Meera, it was no surprise to me! Kokum martini was on my mind but that needs a quiet weekend, which has not been on the cards of late. Purnima and Lissie, kudampuli is also garcinia but it is garcinia gummi-gatta or garcinia cambogia. It is very sour and the flavor is different from that of kokum. So is the smell. Gini makes a fabulous Kottayam fish curry which I have made with both kokum and kudampuli. Kudampuli wins hands down in that recipe! Kudampuli is also thicker than kokum. I will try to include comparison pics in my next post. Aparna, sol kadi was a staple in our meals till my father was asked to cut out coconut from his diet. No meal was perfect unless the last two bites of rice were eaten doused in sol kadi. And it wasn't uncommon for folks to hold out a cupped fist to be filled with sol kadi which they would drink at the end of the meal. There is a coconut-less version called futi kadi which is also very refreshing. I hope to go back to my roots now that I have a stash of kokum! Any idea what Kokum is in Tamil? hey, Im visiting ur blog for the first time and found it very interesting... keep up the good work!! Manisha, pls chk my post, its just that I truly appreciate whatever little con. we have had, helped me a lot!! I am too late to post a comment on this mystery! So it's kokum, ha! I never saw kokum before or used it any recipe, though heard about it in some blogs. Thanks Manisha! Observer, no clue, sorry :-( From whatever I have read, kokum is not native to Tamil Nadu. In Marathi, we also call it amsol or amsul or sol. Ray, thank you and best of luck with your web site. Marlene, thanks and welcome to IFR! Purnima, thank you! You are a sweetheart! I will get in touch soon! 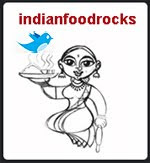 Uma, isn't it great how we find out so much about different regional cuisines through blogs? Deepu, not Indian food? Yet you have a web site about Indian food, you say? Interesting. Oh and what you just did? It's called comment spamming. Please desist from using my comment space to promote your web site. Another link drop and your comments will be deleted. kindly post a clear picture of kokum.